Barely 10 days into the new year and sedition was put to use, this time against prominent writer Hiren Gohain in Assam, along with activist Akhil Gogoi and journalist Manjit Mahanta. And four days later, Delhi police filed its chargesheet in the sedition case against JNU student leaders Kanhaiya Kumar, Umar Khalid and Anirban Bhattacharya, among other students. Last year, journalist Kamal Shukla was charged with sedition for sharing a cartoon in the wake of the Judge Loya death case while a 21-year old youth, Junaid Khan, spent five months in jail because he became admin of a Whatsapp group by default and police said objectionable content was shared on the group! Lying is an art. It’s not enough to just lie. One also have to time it well. A sense of timing, of placement, is what makes one a master liar. And of course, one also needs to stage one’s own cheerleaders who would celebrate each of one’s lies. That is the role of most of the media today under this regime. But the people of the country have been dealing with these sanghi Thugs of Hindustan long enough now. It’s been five years, nearly. They know by now that it would be raining lies as it gets closer to the elections: mandir, statues, 10% reservation, “anti-national”. If the last four years saw the people of the country grappling with one jumla after the other, the closing months would be seeing the crescendo in the symphony of lies. Even with us, around the “JNU row” as they call it, its not that they didn’t have their lies ready three years back. But of course, they needed to submit them in the form of a chrgesheet in the last hundred days. As the people of this country have prepared their own chargesheet against this anti-people, anti-poor and communal govt, the government once again wants to deflect attention from it’s failures by raking up this issue just before elections. They need to bury their failures under these lies. Assam has been on the boil with the National Register for Citizens (NRC) and then the passage of the Citizenship Bill, which seeks to exclude non-Hindu refugees from Pakistan, Bangladesh and Afghanistan into India. According to reports, a meeting was held by the “Save Assam” forum in Guwahati and attended by eminent citizens, including former Assam DGP Harekrishna Deka, former CMs Prafulla Mahanta and Tarun Gogoi, and several activists. The Guwahati Police Commissioner Deepak Kumar said that several statements were made in the meeting and these will be investigated. The bill, people of Assam felt, ‘violates the basic tenets of 1985 Assam Accord and poses a threat to the Assamese community’. According to the complaint Gogoi criticised the Bill and talked about “initiating a struggle for a sovereign Assam, independent of India”. 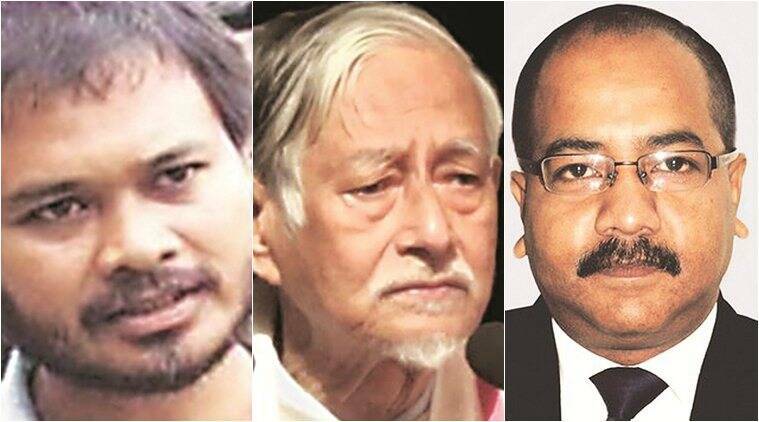 Activist Akhil Gogoi, academic Hiren Gohain, and journalist Manjit Mahanta.